tothe fledgling beach town proved only the beginning of the diverse community which it has become. Today, vacationers to Redondo Beach find something to suit every taste whether it be a romantic getaway, a relaxed outing with friends or a family gathering. The Pier, the hub of activity, draws residents and visitors year ‘round with a variety of leisure pursuits, dining options, shopping, access to fishing, games and entertainment. Through the summer free concerts on the pier offer an assortment of well attended music fests featuring Rock/Pop, Latin/Fusion, Jazz, Reggae, New Age, Pop, Disco and Blues with the ocean waves providing a soothing accompaniment. Clubs for adults keep night owls entertained with a variety of bands and musical groups. Portofino guests depart on bicycles. set the list is endless. A bicycle path, mostly alongthe beach, stretches for miles and when it partially diverts to the Redondo Beach streets, it offers a wide, clearly marked route safe from cars. 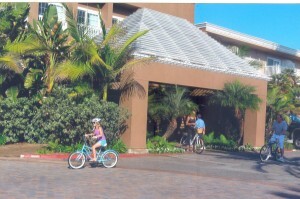 Marina Bike & Skate Rentals and several hotels, including the Portofino and Crowne Plaza, offer bicycles for guests during their stay. Other modes of recreational transportation in this environmentally conscious city includes the Beach Barcycle, a unique and fun group activity where passengers pedal along Redondo Beach streets protected from the sun by a canopy while getting exercise, enjoying camaraderie and being environmentally responsible. Touring the beachfront Strand via Segway Cruisers provides another unusual experience as vacationers mount the zero emissions personal transporter. This versatile vehicle, easily learned and lots of fun can be ridden along trails, the boardwalk and bicycle paths. In the protected area inside the breakwater, vacationers rent kayaks, both single and double, canoes, outriggers, pedal boats and the newest craze, stand-up paddle-boards. A variety of boating activities inside the breakwater. For a relaxing ocean experience there’s whale watching aboard Voyager Excursions during part of the year and viewing the always playful dolphins cavorting alongside the boat. Passengers delight in watching the antics of sea lions perched on buoys and their own special island. Aboard the Looking Glass boat passengers view the colorful sea life beneath the ocean’s surface as the captain provides a snack for the fish who gather around the glass windows. Scene of the ever popular annual September Lobster Fest, Seaside Lagoon offers a favorite family gathering locale for sheltered beach and water activities, perfect for groups with young children. 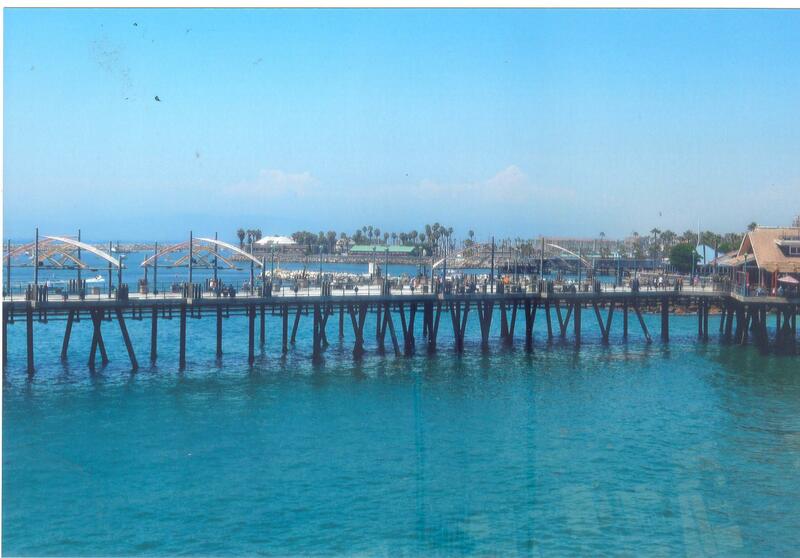 Along Southern California’s coast, no other city includes as many ocean view restaurants as does Redondo Beach. Diners may choose from the most elegant to the humblest of eateries. The Bluewater Grill, a classic fish house specializes in charbroiled seafood, house made chowders and includes an oyster bar. Samba boasts a Brazilian flavor with a variety of meats and an oversized salad bar along with glamorous dancing girls. 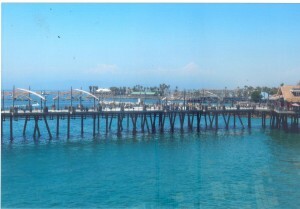 Kincaid’s is a great bet for fish, chops and steaks with a great view of the pier. Captain Kidd’s, a combination fish shop and restaurant serves up very fresh and delicious fish in a casual atmosphere. Polly’s on the Pier, another casual dining spot always seems to have people waiting in line, especially for weekend breakfasts…very old school and homey. The unique Barcycle provides "green" transportation. to a full service fitness club. Most vacations include a bit of shopping and the Riviera Village Certified Farmer’s Market provides a tasty experience. With a background of musical entertainment, shoppers treat their taste buds to some irresistible gourmet and mostly organic products from certified farmers as well as artesian non agricultural samplings. Buy some healthy snacks to take back home or to one’s hotel room. Exploring the many Redondo Beach boutiques provides a unique shopping experience and there is always the South Bay Galleria featuring nationally known stores including Nordstrom’s. One of Hollywood’s favorite filming locations over the years, Redondo Beach offers something for everyone be they shoppers, foodies, relaxers, adventurers or movie makers.